I'm READY to join you in standing up for accountability if Trump fires Mueller or otherwise clearly obstructs justice in the Russia investigation! We’re ready to go all-in... planning a national campaign, along with key allies, to respond in the biggest way possible, and that includes getting thousands of Americans at protest events that day if Trump crosses this bright red line. There are reports that Trump already tried to fire Mueller very early after Mueller came on to head the investigation -- reports that Trump denies. At this point, we must remain especially vigilant to make sure that if Trump does in fact execute a move to fire Mueller or obstruct his work, we, as a country, are ready to hold him accountable. 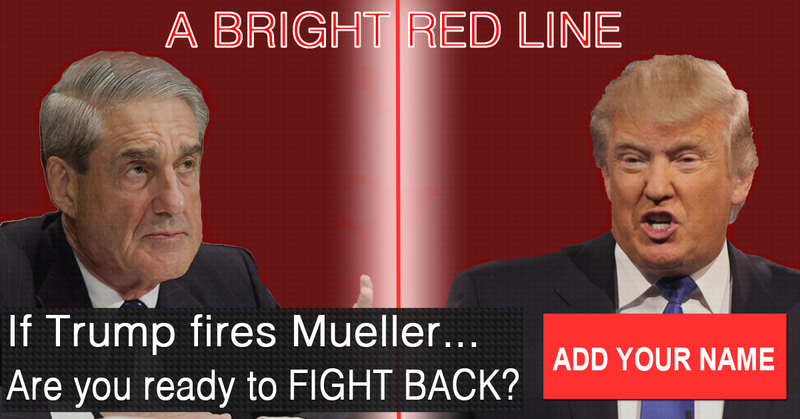 Please add your name now to let us know that you’re with us and ready to fight back immediately if Trump fires Mueller!